A Web Service (WS) is a type of component specifically conceived for distributed machine-to-machine interaction. Interoperability between WSs involves both data and messages exchanged and protocols of usage, and is pursued via the establishment of standard specifications to which service providers must conform. In previous work we have envisaged a framework for WS testing. 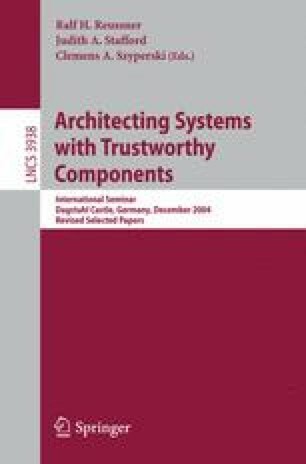 Within this framework, this paper focuses on how the intended protocol of access for a standard service could be specified, and especially on how the conformance of a service instance to this specified protocol can then be tested. We propose to augment the WSDL description with a UML2.0 Protocol State Machine (PSM) diagram. The PSM is intended to express how, and under which conditions, the service provided by a component through its ports and interfaces can be accessed by a client. We then propose to translate the PSM to a Symbolic Transition System, to which existing formal testing theory and tools can be readily applied for conformance evaluation. A simple example illustrates the approach and highlights the peculiar challenges raised by WS conformance testing. This work has been supported by the European Project TELCERT (FP6 STREP 507128), by Marie Curie Network TAROT (MRTN-CT-2004-505121), and by the Netherlands Organization for Scientific Research (NWO) under project: STRESS – Systematic Testing of Realtime Embedded Software Systems.